Are you longing to know how to make the delicious food you read about? Look no further! Grab your whisk, put on your apron, and tell your harem to get chopping. From spicy to sweet, you'll find a recipe for every occasion in this droolworthy cookbook brought to you by 21 bestselling reverse harem authors. 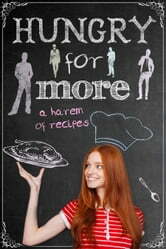 Get ready to try out 50+ recipes featured in some of your favourite reverse harem stories. All proceeds go to charity! This is great!!! Not only are there excerpts from some of my favorite book that go with each recipe, but there are books that I haven’t read and am now adding to my TBR pile! The way each recipe is set up is adorable, with the difficulty level being measured by harem sizes (1 guy, 2 guys and so on), and the pictures are beautiful (and delicious looking). I cannot wait to try some of these recipes out (I will definitely be posting pictures with #RHcookbook attached to them), and to read the books I hadn’t yet read. Plus, the proceeds from each book purchase go to the charity, Action for Hunger!